On May 22, Romani families living near the village of Velyka Berezovytsia, Ternopil’ were attacked by a group of armed masked men carrying bats and firearms which they used to drive the Roma into the forest. Three people were injured in the attack and a local human rights activist confirmed to the European Roma Rights Centre (ERRC) that shots were fired in the settlement. The UA Ombudsman has sent a request to the regional administration to provide people with shelter and food. After the 7 adults and 30 children were dispersed, the masked men set fire to the makeshift homes belonging to the Romani families, destroying all of their belongings including their passports, birth certificates and money. The families are currently hiding in Ternopil’ without shelter, money or food for their children. According to an eye witness, far-right and nationalist organisations were behind the attack on the settlement. Doctors at the local hospital were also forced to call the police when in a separate incident, more men attacked the injured Roma as they were being brought in for treatment. 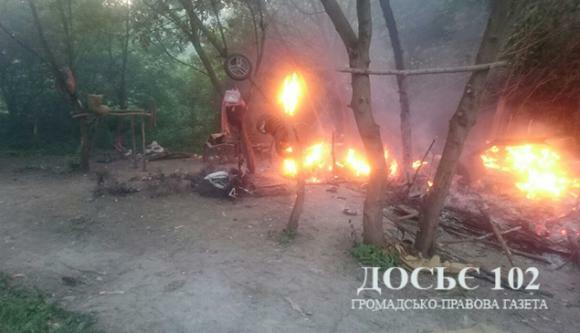 Lyudmyla Denysova, the Ukrainian Parliamentary Commissioner for Human Rights said that the attack showed indications of 'discrimination on ethnic grounds and inciting animosity towards the Romani national minority'. She reported that a criminal proceeding has been opened and that she has filed an appeal to Ternepol regional police with a request to take all necessary measures in accordance with the law. “I don’t trust the police” said one of the Romani women from the camp to an ERRC activist. “The next day I saw the police officer drinking coffee with one of the guys who attacked our camp.” She added “One of the guys who attacked us threatened to find us even underground if we dare to complain to the police”. The ERRC is working on the ground to ensure first and foremost that the families are safe, and are returned to their home region of Zakarpattya. This case is being considered in light of the recent attacks on Roma in Kiev and Lviv, as well as other instances of mob violence against Roma in recent years.